Choosing which of the many whisky distilleries to visit in Speyside might be a difficult task, but selecting a hotel for our whisky trail experience ended up being fairly easy and painless. There are several towns along the trail that make a good base for distillery-hopping, so my advice is to narrow down the distilleries you plan to visit and then see what accommodations are central to your selections, or at least close to one of them. Everything is pretty much within a 10 or 15-minute drive in between stops, so you won’t end up spending too much time in the car either way. Chris selected eight whisky distilleries in the region to visit and we decided to stay at The Station Hotel in Rothes, which is in walking distance of Glen Grant (one of the eight on our list). Our room is pictured below on the second floor above the front entrance and the restaurant, Toots. 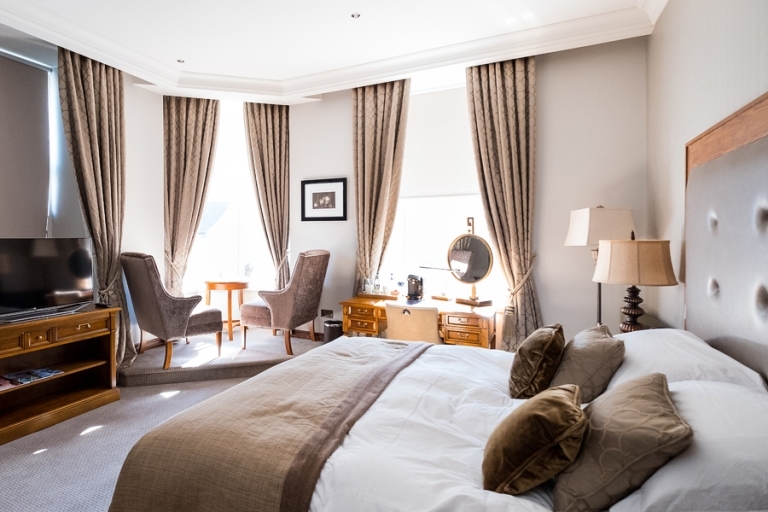 Normally that location would be a deal-breaker for me due to the noise potential, but the Glenrothes suite was so beautiful and comfortable I didn’t want to move to another room, and it ended up being quiet enough and super comfortable. 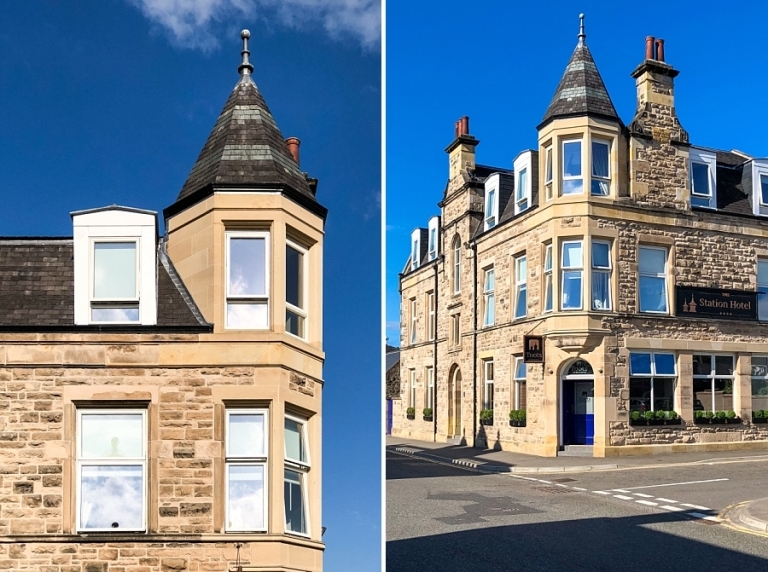 The super spacious Glenrothes suite offers a wonderful view of the centre of Rothes town, although when we visited in mid-summer we kept the shades drawn most of the time to help with the sun and heat. The room warmed up rather quickly! The first night we did have a little trouble sleeping with the windows open due to the street noise, but the second night I cranked up my white noise machine and drowned out the sound of the lorries passing by. And let’s be honest, a day of whisky tasting probably also helped with the sleeping. 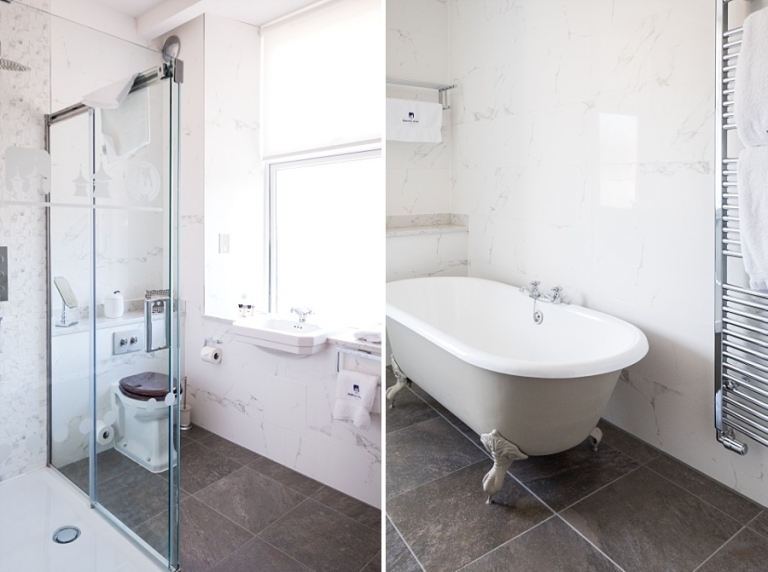 With a clawfoot tub, marble tile, natural light, and a towel warmer, I couldn’t love the spacious, spotless bathroom more. Fluffy robes and beautiful toiletries rounded out the list of reasons this might have been my most favorite hotel bathroom ever. And of course, a proper trailside hotel offers Speyside whisky upon arrival. If you don’t get your fill on the trail or if there’s a whisky brand you would like to try, the bar & bistro on the ground level, Toots, has an impressive selection of spirits and a cozy atmosphere in which to have a wee dram. Not pictured, The Spirit Safe on the same floor is another option for drams and cocktails. And while Speyside is all about the whisky, we thoroughly enjoyed our dining options at the hotel as well. I tried Welsh rarebit for the first time (yum! ), and Toots offers an amazing sticky toffee pudding that we may or may not have eaten more than once. 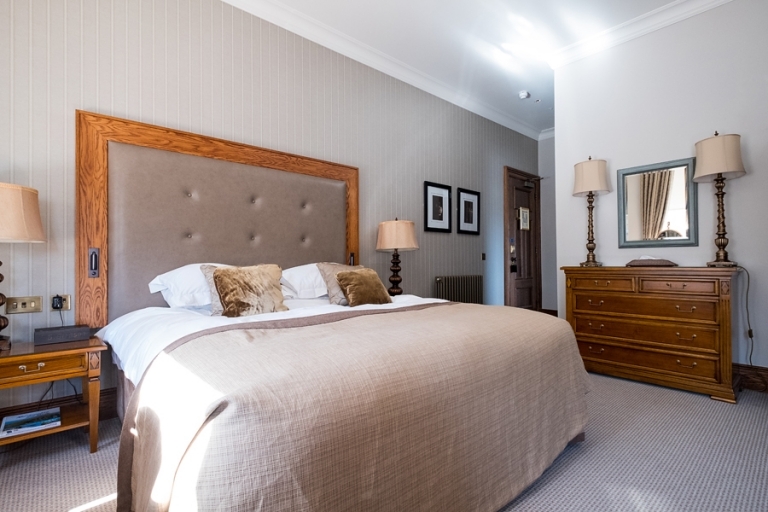 Our three nights at The Station Hotel provided just what we needed at the end of our long days touring Speyside’s distilleries, and we would absolutely stay there again! And we would order the sticky toffee pudding again (and again). In fact, if you don’t stay at the hotel, it’s worth popping by just for dessert. Note: The hotel did not sponsor this post – we just really enjoyed our stay! On Day Three of our Speyside adventures, the four distilleries on our agenda make up somewhat of a superlatives list: most beautiful, most iconic, most modern, and most adorable (you’ll see what I mean). We started the day by simply moseying down the street a few meters from our hotel to the Glen Grant distillery. We read online that the distillery is also home to a beautiful Victorian garden, so we arrived about 45 minutes before the start of our tour in order to get some fresh air and enjoy the outdoors. It turned out that the “small path” that “winds its way up the garden” (per the website) is actually several acres of land and the path extends about a mile into the garden. It is indeed beautiful, but the garden is much bigger than I anticipated! It’s more like a park. If you want to see and enjoy the better part of it, you’ll need more than an hour. We started off at a very leisurely stroll and ended up practically jogging back to the visitors’ centre to show up on time for our tour. Though it’s perhaps the most iconic distillery in Speyside, we chose not to tour Glenfiddich in exchange for eating lunch at the Malt Barn restaurant. Home to the largest pouring collection of Glenfiddich whiskies in the world, Chris ordered a whisky flight alongside our meals and I thoroughly enjoyed a Diet Coke. We narrowly added The Macallan experience to our itinerary, because the new visitors’ centre only opened a month before we arrived and they weren’t taking online bookings until about two weeks before our trip. The state-of-the-art centre, also a production facility, is obviously the most modern distillery in the region. Our tour immersed us in the world of whisky with swiveling displays and flashy visual effects, and ended with a guided tasting at a sleek bar and lounge. Visiting The Macallan is a completely unique experience compared to the traditional distilleries and I quite prefer the old-school operations, but I appreciated seeing something different. Last but not least, we made our way to Cardhu, the distillery I was most looking forward to the whole trip. Fun fact for you: Cardhu is the first distillery to be officially pioneered by a woman. But that’s not why I was excited to visit. You’ll see! We actually arrived a little late and missed the first few minutes of our booked tour – note that four distilleries might be too much to squeeze into one day. We were offered the option to catch up to the tour group, or skip to the tasting straightaway. Since we had learned pretty much all we could learn about the whisky process, we opted to go straight to a tasting, and actually I opted out. I had reached my limit of even tiny whisky sips. I patiently waited while Chris enjoyed the samples, because the reason I wanted to visit Cardhu was our next activity: find the cows that we heard live near the distillery! I asked at the visitor’s centre desk if there are cows nearby and if so, where we might find them. It turns out they were just steps down the road! We walked over to the farm and spent kind of a ridiculous amount of time there cooing over the coos, taking photos of these guys, and offering them pre-approved ginger biscuits. Perhaps not as squeal-worthy as highland cows, I did yelp for Chris to pull over when we happened upon this cooperage while driving around. The geometry, colors, and textures of the barrels simply begged to be photographed. I took the Mavic up for a quick flight here, too, after business hours so no one was around. Our dinner consisted of takeaway pizza near our hotel because that’s what sounded good at the time, but I don’t seem to have photographic record of it. The next morning (Sunday), we got back on the road toward Glasgow to attend TRNSMT Fest, but not without stopping for photo ops a few times on the way. I didn’t find out about nearby Ballindalloch Castle until it was too late to plan it into our schedule, but we got to see the cute bridge and guard post – at least I think that’s what it is. And that ends our time in Speyside! If you are a whisky lover, I highly recommend getting yourself to the Malt Whisky Trail as soon as possible. You’ll have such a good time! Please do feel free to let me know if you have any questions about planning your own trip to this region of Scotland. Cheers! After spending a day in Glasgow, Chris and I set off the next morning on a road trip to Speyside in order to visit the distilleries along the Malt Whisky Trail. Chris has become a huge fan of whisky and we had tons of fun touring the distilleries on Islay a few years ago, so we decided to spend three days in this region on our quick five day-trip. Note that while I’m not a whisky drinker, I do like to participate in the tastings, and I enjoy learning about the process and the culture. And I’m always happy to have any excuse to travel anywhere. Plus I’m designated driver if needed! After just under four hours on the road we arrived in the Speyside area, and first things first, we stopped for food. Most notably, we followed up our lunch with whisky ice cream at Balvenie Street Ice Cream in Dufftown. Now this is a whisky I can get excited about! The sweet option, rather than fruity or peaty, hit the spot. Chris probably would have enjoyed the peaty version, but he let me pick since he would be enjoying many whisky varieties soon. Before I dive into our itinerary, I thought I should explain how we planned our Speyside visit. From what I understand, distilleries in Scotland generally require whisky tastings to be paired with an educational experience such as a tour, so if you want to try the whisky at a distillery you need to sign up for their tour. In some cases you might be able to try a small sample in a distillery’s shop, but we did see some guests without tour reservations who were turned away. The tours ranged from £5-50 pounds per person, and lasted anywhere from 45 minutes to three hours. Most distilleries required advanced booking, so Chris picked which ones he wanted to visit (seven of them, plus one we added at the last minute) and we made reservations two months before our trip. 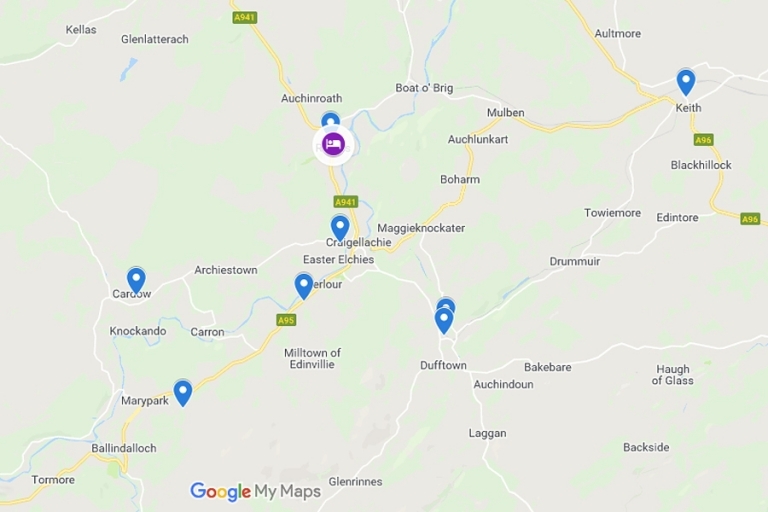 It does take a little work to arrange the schedule depending on the number of distilleries on your list, so if you’re planning to visit Speyside for a similar experience, don’t wait until the last minute to book! Even as early as we booked, tours were already filling up and our plan ended up being a little less efficient than it could have been with a bit more lead time. Our first tour of the weekend was at Balvenie, arguably the most in-depth tour offered in the region. The soup-to-nuts tour and guided tasting lasted around three hours, and it ended up being our favorite of the trip so we started off on a very high note! My favorite part was definitely the time we spent in the cooperage where the coopers assemble the barrels in which the whisky is aged. Balvenie is one of the few distilleries in the world that has a cooperage onsite (most operations outsource the barrel making) and it was our first time seeing the process. The Balvenie tour also offered one of the most generous and informational tastings of all the distilleries we visited. We tasted seven samples, including a 30-year-old, the oldest whisky we’ve had the opportunity to try so far! After our tour, we popped over to Balvenie Castle to explore and take some photos and video with the Mavic. We didn’t see any other visitors on the property (one of the main drone rules in most places is not to fly over crowds or within a certain distance of people in general), so I took the opportunity to fly for a few minutes and record some really cool video footage. Unfortunately I was shooed away by a staff member because there is a residence across from the castle (that I wasn’t filming at all) so for privacy reasons she didn’t want me to fly there. Oops! I had also hoped to take an aerial photo of the Craigellachie bridge, but there were a few people nearby so I didn’t do any flying there. We stopped by a few times actually, and always saw people on the bridge or on the beach below. It’s a popular spot! Tired from our travels, tour, and tasting, we returned to our hotel in Rothes, The Station Hotel, for dinner – more on our accommodations in an upcoming post. The next morning we started Day Two with a tour at Aberlour (whisky drinking at 10am is perfectly acceptable in Speyside) where the highlight was a fun guessing game during the tasting. Our guide gave everyone in the group four unmarked samples and asked us to smell them and match them to the casks we smelled earlier on the tour. Guess who was the first to get them all right? The non-whisky drinker on the tour: me! The nose knows. For lunch Chris and I ate at the super cozy and iconic Mash Tun whisky bar where we tried haggis in nachos-form. It was tasty! Afterward we headed over to the famous Walkers Shortbread shop to buy and eat as much shortbread as we could. Note that the shop (not pictured) is next to the manufacturing operation in Aberlour, but there isn’t a tour of the factory which is kind of a bummer. The shop does have an extensive selection of shortbread including several products that are unavailable back in the States though. Bellies full from lunch and shortbread, we headed to Strathisla which was a late addition to our itinerary so we didn’t have a tour booked, but we were able to do a small tasting in their beautiful visitors’ centre. Even if you don’t have a tour booked here, it’s worth stopping by to see the famous and picturesque twin pagodas. We ended our day with a tour and tasting at Glenfarclas, our first Glen (which translates to “valley”) of the trip. Look at those skies – how lucky were we with this weather?! And before you wonder if I was toured-out at this point, oddly the visits were different enough that I wasn’t bored with learning about whisky. I’m not sure what Chris’s threshold is, but eight distillery visits (five full tours) ended up being a good amount for me. Not only for the convenience but also for the delicious food, at the end of Day Two we ate dinner at our hotel again, which is rare for us. We normally like to try as many different places as possible, but the restaurant at The Station Hotel is fantastic. Since this post seems long enough already I’m going to stop here – stay tuned for the second half of the story! It’s a jam-packed Day Three with the remaining four out of eight distilleries. Chris and I spent last weekend soaking up as much time out of the house as we could, enjoying the spectacular display of fall colors that Virginia puts on every year. I snapped this photo with my Mavic Pro after finding this spot on a drive out west. Chris and I are huge fans of The Killers and CHVRCHES, so when we found out that both bands were playing at TRNSMT Fest in Glasgow, Scotland, we immediately set our calendar reminders to buy tickets as soon as they went on sale. Chris had also been itching to visit Speyside, so we decided to extend our July 4th holiday into an extra long weekend in order to cover the festival and the whisky trail. On the eve of July 3rd, we hopped on an overnight Icelandair flight to Glasgow and found ourselves celebrating Independence Day the next morning in the United Kingdom. A bit ironic perhaps, but we couldn’t think of a better way to spend our holiday! We stayed at the Radisson Blu Glasgow, just steps away from Glasgow Central Station and one block from the car rental office where we planned to pick up a car the next day for a road trip to Speyside. Our room was super clean, comfy, and convenient! In an effort to beat jet lag and make the most out of our first of two days in the city, we set out on foot after getting checked in to explore and to find some lunch. Glasgow is quite walkable, and we had an incredibly gorgeous summer day to enjoy a sleep-deprived stroll. I suppose it’s somewhat cliché, but as soon as we touch down in the U.K. I always instantly crave fish and chips, so we stopped into The Butterfly and the Pig for the traditional dish. And when I say we stopped in, I mean first we accidentally seated ourselves in the tea room upstairs before realizing the full restaurant was downstairs. Oops. It was worth the minor embarrassment though – our delicious meals hit the spot. This was actually my first time trying mushy peas and I loved them! How did I miss this comforting side dish the first three visits to the U.K.? Operating on no sleep from the previous night, we decided to give in to a bit of laziness and booked tickets on an open-top bus tour. We’ve done these bus tours a couple of times in different cities and it’s such a great way to cover a lot of ground in a short amount of time. Our guide, Peter, kept us perked up with hilarious and informative commentary. We were treated to some of Glasgow’s most beautiful sites including Glasgow University, George Square, and Glasgow Cathedral. Sometimes we use the hop-on-hop-off bus as transportation to reach the major sites, doing the hopping on and hopping off thing, but this time we just stayed on the bus, enjoyed the fresh air, and listened to the guided tour since we were short on time and energy. One of our quirky travel traditions is eating Mexican or Tex-Mex food in every country we can find it (once we’ve already covered the local cuisine as much as possible), so we continued the tradition at Topolabamba for dinner. We indulged in various margaritas and street food small plates, and we would definitely eat there again if/when we get to return to Glasgow! Our Mexican dinner (promptly followed by passing out at our hotel) wrapped up our first day in Glasgow. The next morning we walked down the street to pick up our rental car and set out on a road trip to Speyside. We spent three days wandering the whisky trail and tasting Speyside’s finest, and then we returned to Glasgow for TRNSMT Fest. A Speyside whisky adventures post is up next, but first a few images from our time at the festival! Oddly enough despite our love for live music, this was our first time attending a big music festival, so we didn’t really know what to expect except maybe large crowds and pricey drinks. I’m not a huge fan of crowded places (an understatement) so we purposely didn’t show up as soon as the gates were open and although TRNSMT is a multi-day event, I only purchased one-day tickets for the same reason. Spoiler alert: we had tons of fun! But one day was plenty. We rolled into Glasgow Green mid-afternoon knowing that our favorite bands would take the stage later in the evening. In the image below, the red arrow points to our spot for the night after wandering the grounds and grabbing drinks and snacks. It was fairly unobstructed with a good view of the stage! Franz Ferdinand played a really great set to an energetic audience, and then the crowd seemed oddly mild-mannered for CHVRCHES, but when The Killers took the stage everyone went bonkers. I’ve never seen so much energy at a show. With nary a spare inch of personal space (eek! ), we were literally swept up in the movement and excitement of the people surrounding us. People chanted and danced and sang every word at full steam. Several times a very joyful Scottish woman grabbed both Chris and me by the arms and pumped our limbs into the air with hers. I was laughing so hard and enjoying myself that I overcame any anxiety about the crowd level, and we had a great time! The festival went off without a hitch as far as I could tell. Drink lines moved swiftly, security at every gate eased my mind, and since Chris and I opted for VIP tickets we were treated to the upgraded restroom situation, a very nice perk. So as far as music festivals go, I couldn’t think of a better place to experience my first one! The people of Glasgow sure know how to party. I’m glad we decided to put the rest of our trip before the concert. The next day we returned home to the States exhausted and happy from our quick jaunt to Scotland and we already can’t wait to return. Up next: our three days in the Speyside area in which we managed to visit eight whisky distilleries!